Bill Pugliano/Getty ImagesConsumers believe that airbags will save them in a crash. The Takata airbag recall has continued to expand. 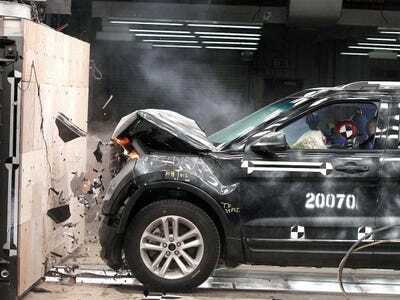 Nissan has increased the number of vehicles recalled in the United States for passenger air bags manufactured buy the Japan-based Takata that could explode with too much force and spray metal shrapnel at occupants. While cars and trucks are recalled all the time for problems that are both minor and severe, the specifics of the Takata recall are troubling. Airbags are one of the major safety innovations of the past 30 years in the auto industry. Consumers have come to associate airbags with surviving crashes — not being severely injured when they malfunction. The recall in 12 U.S. states and territories with high humidity replaces and expands a recall that began in June, according to documents filed with the National Highway Traffic Safety Administration. The earlier recall was part of a requested action by NHTSA in response to questions about air bags made by Takata. The recall now covers 52,738 vehicles, up from about 30,000 previously, according to the NHTSA documents. Nissan’s recall in June covered vehicles in four U.S. states and territories. Nissan said in a statement on Monday that it had expanded the June recall based on additional information from Takata and after consulting with NHTSA. An unidentified number of the recalled vehicles have already been repaired, according to a letter Nissan filed with NHTSA. More than 11 million vehicles in the United States and 17 million globally have been recalled for the potentially defective Takata air bags. At least four deaths, all involving Honda cars, and more than a dozen injuries have been linked to the problem. Nissan said it had received three injury claims stemming from the air bags. Under the Nissan recall, the front passenger air bag inflator will be replaced at no cost, according to the NHTSA documents. If a replacement inflator is not available, dealers may temporarily disable the air bag and advise customers not to use that seat, a step previously taken by Toyota. The affected Nissan vehicles include Pathfinder SUVs from model years 2003-2004, Sentra cars from 2004-2006, Infiniti FX35 and FX45 crossover SUVs from 2003-2005, Infiniti I35 sedans from 2003-2004 and Infiniti M35 and M45 sedans from 2006, according to the NHTSA documents.